Stop by your JCPenney location on Saturday (8/19), where they’ll be giving out $10 off $10 purchase coupons (and possibly $20 off $20)! Coupons will be given out while supplies. Last time around, they ran out of coupons relatively early. I recommend heading there early to get your coupon! 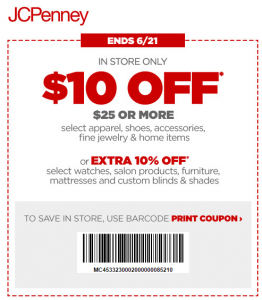 Valid through Sunday (June 18th), you can get $10 off a $25 purchase at JCPenney, valid on apparel, shoes, and accessories! Just click here to access and print out your coupon. This is valid in-store and online on JCPenney.com with code BIGSAVE8 at checkout. Be sure to read the fine print, several restrictions apply. Valid through Tuesday (May 9th), you can get $10 off a $25 purchase at JCPenney, valid on apparel, shoes, and accessories! Just click here to access and print out your coupon. This is valid in-store and online on JCPenney.com with code GIFTMOM7 at checkout. Valid through Monday (September 5th), you can get $10 off a $25 purchase at JCPenney, valid on apparel, shoes, and accessories! Just click here to access and print out your coupon. This is valid in-store and online on JCPenney.com with code LABORDAY at checkout. Planning a trip to JCPenney? Valid through Sunday (January 10th), you can get $10 off a $25 purchase at JCPenney, valid on apparel, shoes, and accessories! Just click here to access and print out your coupon. This is valid in-store and online on JCPenney.com with code SUPERSAV at checkout. Be sure to read the fine print, several restrictions apply. This coupon can be used on the following items: original, regular, sale and clearance-priced apparel, shoes, accessories, fine jewelry, and home items. 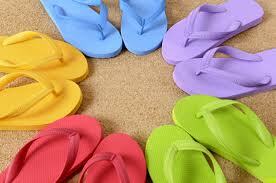 Today (4/12) JC Penny is having Flip Flop Friday where their flip flops will only be $1.00! As an added bonus to this sale, there is also a 20% off PRINTABLE COUPON that you can use, making the flip flops only $0.80! Sign up for JCPenney emails and be the first to know about special offers, best price Fridays and month-long values! What more can be said…$10 off a $10 Claiborne item at JC Penny? WOW!!! 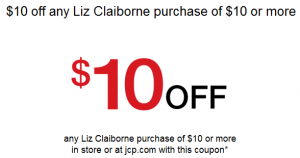 Be sure to print your coupon today: JC Penney Printable coupon for $10 off a $10+ Liz Claiborne purchase (expires 10/1). Be sure to print your $10 JC Penny coupon here today! !